You might not know it every time they come up against each other, but Barcelona and Real Madrid are – statistically, at least – the two most stable clubs in European football. Data crunched by the CIES Football Observatory shows that the two clubs on either side of the Clasico divide retain individual players for longer than any other teams across all of the ‘Big Five’ leagues (based on first team squads registered for domestic league matches between 01/07/2018 and 01/10/2018). Boasting the most loyal players on the continent, Real Madrid are top of the tree with an average retention period of 5.84 years per player, while Barca are close behind with an average of 5.36 years. The highest Premier League side on the list is Tottenham (3.89 years), while Fulham (1.12 years) find themselves toward the bottom end of the ‘least stable’ stakes. Why, it’s almost as it players are inclined to stick around at successful teams. Czech side Viktoria Plzen can claim to be the most stable club outside of the Big Five, with an average of 4.28 years per player, while Celtic (4.25 years) and Shakhtar Donetsk (4.02 years) follow closely behind – with regular Champions League football definitely a major factor. 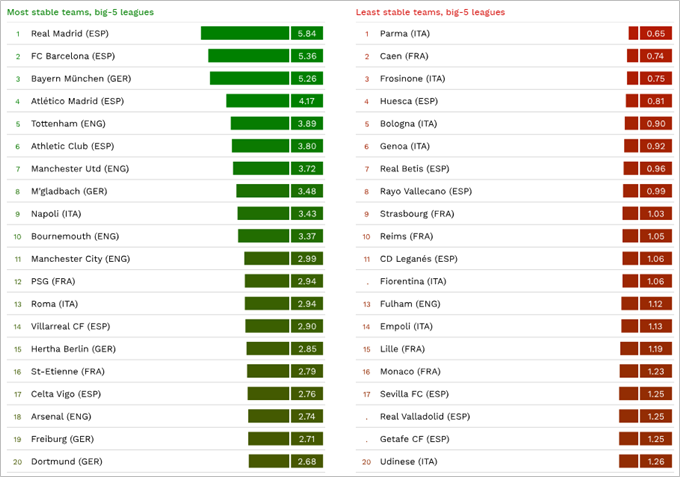 For the record, according to the CIES data, the least stable club across all 31 of Europe’s top divisions is Croatian side NK Istra 1961 (0.15 years), who just don’t seem to be able to convince their players to stick around for very long. The full run-down of the CIES Club Stability statistics is available to peruse here. Of course, they are winning, who would want to leave? On the other hand, stability is not a guarantee of trophies because Tottentham is on the list.